Last week the Supreme Court of Canada released its decision in the Daniels vs. Canada case. Writing for the court, Justice Abella declared that ‘Métis and non-status Indians are “Indians” under section 91(24).’ Much has already been written about the decision and its possible implications. Less well known are the historical arguments which were the foundation of the trial judge’s decision, and which the Supreme Court upheld. In this post, I discuss my involvement as an historian, and the questions of law, power, and intent that were at the heart of the case. Two principal witnesses presented the historical evidence on behalf of the Congress of Aboriginal Peoples, the main plaintiff in the case. These witnesses were Gwynneth Jones and me. Both of us did original archival research and submitted written reports to the Court. My report was 171 pages, and Gwynneth’s report was similarly lengthy. Each of us also testified at trial before Justice Phelan of the Federal Court of Canada in May of 2011 and we were both cross-examined by federal lawyers. Afterward, the federal government presented their evidence, most of which was given by Professors Stephen Patterson and Alexander Von Gernet. Why was this historical evidence important? The plaintiff sought to make the federal government recognize that they had a legal responsibility for Métis and non-status Indians. 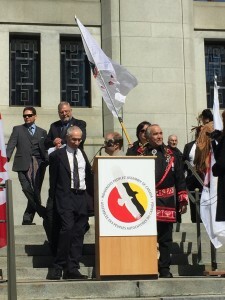 This would mean “that the Government of Canada can no longer disclaim responsibility and continue playing a game of political hot potato with the provinces over jurisdiction.” In making this argument, the Congress’s lawyers focused their attention on section 91 of the 1867 British North America Act. Section 91 is one of the central parts of the BNA Act, outlining the federal government’s jurisdictions. Since 1867, this section has been the subject of much discussion, negotiation, and litigation, which has at times included aspects directly relevant to indigenous populations. For instance, in the 1930s Quebec sued the federal government, claiming that it, not the province, had a constitutional obligation towards Quebec’s Inuit people. The federal government said that section 91 (24) which made ‘Indians and lands reserved for the Indians’ a federal responsibility did not mention the Inuit. Since the Inuit were not ‘Indians’, the provincial government had jurisdiction over them. The Supreme Court disagreed. In the Daniels case, the Congress’s lawyers, Joseph Magnet and Andrew Lokan, took a similar tack, arguing that section 91 (24), which made ‘Indians and lands reserved for the Indians’ a federal responsibility, was meant to encompass the Métis and non-status Indians. However, in contrast to the 1939 ‘re Eskimo case’, which involved discussion about the historical use of the words ‘Indians’ and ‘Eskimos,’ the Congress’s lawyers knew such a strategy was not a winning one. They did so, partly for legal reasons, but also because after the Congress had filed their claim, the federal government had compiled a database of more than 12,000 historical documents which contained references to indigenous people. Many of the pre-1867 documents showed that colonial officials, commentators, missionaries, and others made a clear distinction among Métis, half-bloods, mixed-bloods, and Indians. This would suggest that when the BNA Act was enacted, most people thought about Indians in a cultural specifically way, distinguishing them from others who were Métis and/or were of mixed race and did not live on reserve. These documents showed that a legal strategy focused on language would be a losing game. And the Congress, after launching the case in 1999, and still not yet at trial in 2006, did not want to lose. They had already invested too much time and money in the process (why the case took so long to get to court is another story, and is one that the lawyers are best placed to recount). It was at this point that the Congress’s lawyers contacted me and other scholars. Among them was Gwynneth Jones, who is a specialist in Métis history. They approached me because one of the three individual plaintiffs was Mi’kmaq. This was Terry Joudrey, who was one of two people who were non-status and who believed otherwise. Initially, the lawyers wanted me to research why some Nova Scotia Mi’kmaq people were disenfranchised as a result of the reorganization of communities in the 1950s. This process, they believed, led to a number of families arbitrarily losing their status. Though the lawyers also wanted me to discuss whether imperial, and later, Canadian governments made distinctions between those Mi’kmaq who were racially mixed and those who were not, I wasn’t much interested in writing such a report, since this had been an issue I had written about for another case four years previously. However, over the next year, the nature of my task gradually changed. Instead of just focusing on Nova Scotia, Andrew and Joe wanted me to examine the nature of indigenous communities in the four colonies which would form Canada in 1867. As well, they wanted me to examine the genesis of section 91 (24) and the broader objectives in making ‘Indians and lands reserved for Indians’ a federal, as opposed to a provincial responsibility. The answer to that question was not so easily given, since there is little documentation from the Charlottetown and Quebec conferences. Though there is mention, briefly, that ‘Indians’ would come under the purview of the federal government, there are no conference minutes or correspondence about why the framers made this decision. To answer the lawyers’ questions, I would have to conceptualize how men like Cartier, Galt, Macdonald, McGee, and others thought about indigenous people and communities. On the one hand, I had to understand the relationships that had emerged in the older colonies, and then make reasonable assertions about what the Constitution’s framers had thought about the indigenous people who lived in Rupert’s Land, the north, and British Columbia. ‘The objectives of s. 91(24) were to control aboriginal people and communities where necessary in order to facilitate development of the Dominion; to honour the obligations to aboriginal people and communities that the Dominion inherited from Great Britain, while extinguishing interests that stood in the way of development; and in the longer term, to civilize and assimilate aboriginal people and communities. ‘However, by 1867, the indigenous population was diverse and this meant that the central government also needed broader jurisdictional powers to deal with all people with an indigenous heritage. This diversity was expressed in a variety of ways. Some communities lived on reserves and farmed; some communities still made most of their income through hunting and fishing, and some were in between these two extremes. The Mi’kmaq of Nova Scotia are an example, as many families combined farming with hunting and fishing and wage work. This diversity was also expressed in terms of bloodlines. ‘By the time of Confederation, many Aboriginals had some non-Aboriginal blood. This included people living in the colonies and in the Northwest. Regardless of their bloodlines people of mixed blood were integrated into communities who officials identified as Indians and treated them as Indians. And officials believed that all these people with Indian blood had rights and interests as Aboriginal people. ‘Regardless of their bloodlines, the objectives of assigning jurisdiction over ‘Indians’ to the federal government in the BNA Act could only be achieved if the federal government’s jurisdiction extended to mixed-ancestry Aboriginals. This was necessary because the framers believed that these people posed a potential threat to the economic and political development of the new Dominion. Do we really know what Cartier and Macdonald thought? Can we really know what was in their minds when they participated in crafting the BNA Act? No. We can’t really know what people thought in the past. We can make some reasonable conclusions based on what we know about them and the time period in which they lived. We can only make these conclusions, however, by sifting through the thousands of documents which speak to their lives and to the time period in which they lived, and, I should add, through the valuable and insightful comments other historians have made. Without being able to do, and to know, these things, the Daniels case may not have concluded the way it did. “Indians” today is a fixed term, which has emerged out of a specific historical context, and which continues to evolve. For this reason, judges and justices who try and understand the meaning of Section 91 (24), would tend to be swayed by their present and how our current cultural milieu understands that word. Words, however, are historically constructed and historians are best placed to reconstruct, however imperfectly, the sense in which those words once lived. Did I enjoy working on the Daniels case? Sometimes, yes, sometimes no. Court cases, and especially court cases which involve a lot of additional research and work, and which also have enormous stakes, are not fun. They are a slog and a slog which sometimes can end badly, for the lawyers, for their clients, and for the historians who testify. Thankfully, this time it ended well. But that doesn’t always happen. For those who are, or will be, so engaged, remember that there are both joys and dangers awaiting you. William Wicken is Professor in the History Department at York University. An historian of indigenous peoples and the law, over the years he has testified in 17 separate trials, four of which have been heard on appeal to the Supreme Court of Canada. Thanks for writing this, Bill! It sums up the issues and the work very well.